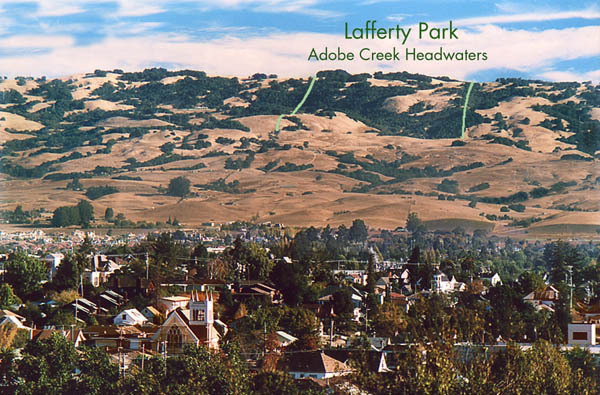 While Lafferty Park has not yet been opened to the public, a number of accomplished photographers have had access to the property on behalf of the City of Petaluma. On this page, we present a sampling of their work, to give an idea of the spectacular scenic appeal of the park. NEW! 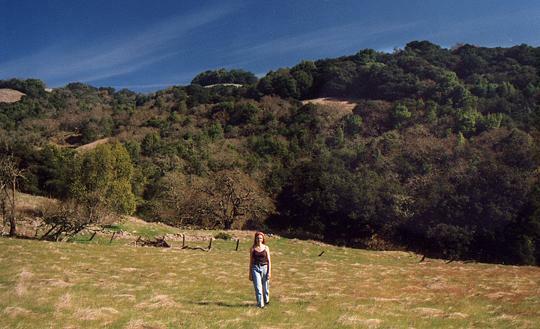 Photos of the neighboring Mitsui Ranch, where a trail has been offered which could one day connect Lafferty to Jack London State Park on the east side of Sonoma Mountain. Flowers of Lafferty. Selected flower photos taken on the Lafferty Park property by Jeanette Loew, with permission from the City of Petaluma. Photos and descriptions of the 2002 "Walk to the Park" events. This panoramic shot looking south and west toward the Petaluma Valley and San Francisco Bay from Lafferty Park's upper meadow on the Sonoma Mountain ridgeline,. The prominent mountain center left is Mt. Tamalpais. Photo by Scott Hess. 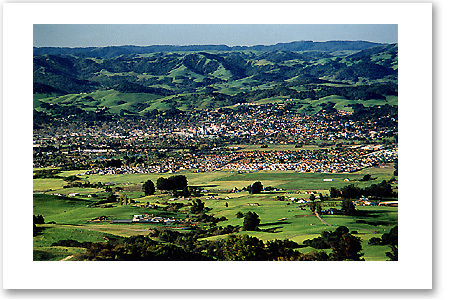 A spring view looking west from Lafferty Park at the city of Petaluma and the Sonoma and Marin County hills beyond. Photo by Scott Hess. Sonoma Mountain as seen from West Petaluma (B Street area), with the borders of Lafferty Park drawn in. A small portion of the Mitsui ranch is visible along the ridgeline to the left of Lafferty Park. Photo by Scott Hess. 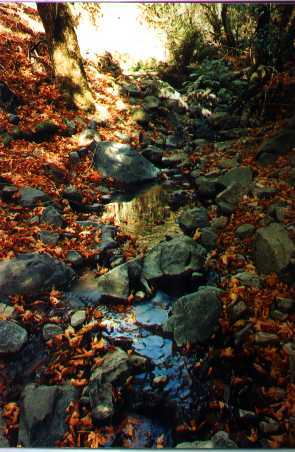 Autumn light and leaves (California Bigleaf Maple) in Adobe Creek at the end of the summer dry season. Photo by Scott Hess. 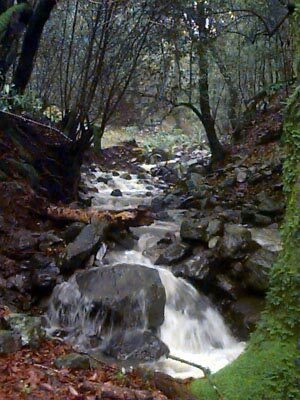 Winter cascade of Adobe Creek. Photo by Robert Ramirez. Lafferty Park's lower meadow, near the site of the old homestead. Photo by Scott Hess. 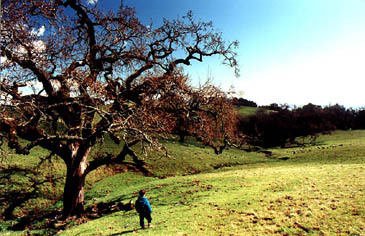 Adobe creek headwaters area, near the ridgetop where Lafferty touches a corner of the Mitsui Ranch. Photo by Scott Hess.